What is up, everybody! Fred Lam here and welcome to our daily huddle episode number 58. We are live right now with my daily huddle and before I begin, I want to wish every single one of you that is an Asian or if you’re Chinese or you’re in Asia, Happy Chinese New Year to every single one of you. This year is the year of the dog and I hope that this year, you guys are going to get an amazing success for your business and hoping and making sure that you have the best health and best shape possible so you could continue to drive your business forward. With that, today is Friday, I acknowledge that a lot of you guys maybe out in a bar or you guys are having dinner, but like I said, whatever I’m going to be doing, I will come on live regardless of how many people is on so that I can continue inspire, to educate and to share my knowledge with you so you could use it and apply it with your business or towards your work or to build your career. If you guys are excited about my daily huddle, make sure you let me know into the comment box right below. In today’s topic, I want to cover something about the exclusion on Facebook ads exclusion. We got someone that asked me to go in-depth on what exclusions are, when did you use it, how it’s being used etcetera. So, I’ll cover that when that question gets brought up, but first, I want to dive right into the 5 questions that we have today. [0:2:22] Question 1: My question is about Facebook targeting. I've been testing a few ads, gotten a few sales here and there, nothing major yet. I seem to have a bit of trouble figuring out how to target so that my audience isn't too broad. I'm selling phone cases, about to run an ad. If I target people who own the kinds of phones that I sell cases for, the audience tends to get really big. If I narrow it down to also include similar brands that sell phone cases, it sometimes goes too small (I've targeted audiences ranging from 100K to 300K so far). Would it be a good idea to run a more open targeting and letting Facebook figure out? Who'd be interested in my ads so I can gather more data? Hi Fred. First of all, thank you for your daily huddle! It’s truly motivating! I don’t usually catch you live, because I’m on Barcelona time, but it’s a nice addition to my morning coffee. My question is about Facebook targeting. I’ve been testing a few ads, gotten a few sales here and there, nothing major yet. I seem to have a bit of trouble figuring out how to target so that my audience isn’t too broad. I’m selling phone cases, about to run an ad. If I target people who own the kinds of phones that I sell cases for, the audience tends to get really big. If I narrow it down to also include similar brands that sell phone cases, it sometimes goes too small (I’ve targeted audiences ranging from 100K to 300K so far). Would it be a good idea to run a more open targeting and letting Facebook figure out? Who’d be interested in my ads so I can gather more data? I’d be very happy to hear what your advice on this would be! Again, thanks for everything and keep up the great work. First of all, thank you, Anna for your support and watching all my videos on a daily basis. Now, to answer your question, I see your page. I saw the product. It is basically an iPhone case. When you’re going after the market, it is kind of little bit hard because for iPhone case, especially the one that you have, it is a little bit generic. Also, at the same time, I do see the pros of the visitor buying your product. So, if you have been dabbling into a 100K and 300k audience and it is working out for you, what I would challenge you to do is to go broad. Now, what do I mean with go broad is really going after the mobile user. Let’s say that if you’re case is compatible for an iPhone X, you want to go to that market. You want to specifically go after the audience that are going to have an iPhone X. When they are on Facebook, they’re having an iPhone X. Inside Facebook, you have the ability to target to those who have what kind of phones. You have that option. All you got to do is just to select that. On top of that, here’s what I would do, I won’t go crazy and say it is a generic phone case and it is a case that every single person that has an iPhone should use. You don’t want to go into the assumption and actually advertise from 18 to 65 right away. I would break it up. So, let’s say if you’re going after primarily to the people that are going after iPhone X or have an iPhone X, what I would do is in your separate ad sets, I would create 5 years apart. I would start at age 24. So, age 24-29, that’s one ad set. Age 30-34, that’s another ad set. Age 35 all the way to 39 is another ad set. By doing so, when you start to allocate $5 budget to each of them, you instantly figure out which audience or which demographic is working the best for you. So, even though you are going broad, you’re still breaking things up. So, you are identifying who your core customer is going to be because at the end of the day, you won’t know if it is the younger demographic or the older demographic that is going to buy. If you want Facebook to figure out, you can but you need a hefty budget. So, what I would ask you to do is to break up the age. If you want to, break up the gender too because if you go after the iPhone X category, there’s so many people that you can go after and it makes your audience size pretty massive. So, break it off into age demographic and run an ad and after 24 hours, really decide and see which demographic is really responding towards your ad. I really hope that tip helps you out and do share your results with us in our daily huddle as well. [0:07:41] Question 2: Why is it that when I have 3 ads running at $5 a day and one of them is reaching out to more than 2,000 people and the other is reaching only 400 or so? Hi Fred. I just want to start out with this. I used to be a very active person working all hours of the day and night until I ended up in a wheelchair. I was in a deep depression until I seen your first daily huddle. I did NOT know where or even what I was going to do. YOU have CHANGED MY LIFE, FRED!!! You inspired me to keep going and that is why I come into this business with eCommerce. A HUGE shout out goes to you my friend! My question is this, why is it that when I have 3 ads running at $5 a day and one of them is reaching out to more than 2,000 people and the other is reaching only 400 or so? I target and research a lot. Just don’t understand why. Pixels are working great, targeting is great, the relevance score is good, just confused. So Michael, it’s a very simple answer for this. It’s because each targeting has its own cost. So, what I mean by that is that the CPM, the cost per thousand, impression or reach for different targetings cost differently. So, the one that actually can reach 2,000 people at $5, the CPM is got to be at least half of your 400 people that you’ve reached. Because again, each targeting, when it goes to the algorithm, it goes into the auction. Obviously, if there’s more people targeting that specific targeting, then what’s going to happen is the price will go up. So, what you have basically have is that with your 3 ads, you’re just having different CPM pricing and bidding on the different auctions thru Facebook so that’s why some of them are reaching more people than others. But at the end of the day, like I said, it all drills down to your CPA, CTR, CPC. CPM is the last thing to really look at. If you’re basically able to strive really well with your cost per click link and it’s doing low, then it means that it has a quick potential that you can turn that into a sale and CPM is not going to be a factor; however, if your CTR is high, your cost per click link is low, then that means that, the CPM is going to be pretty expensive and you got to work extra to ask for that sale. So, it’s a very typical thing. You don’t have to worry about it, you don’t have to feel confused, it’s just that each targeting, they cost differently and it’s just that one cost more than the other and that’s really it. Again Michael, excited for you. Keep hustling, I believe that you will succeed. Just keep pushing forward. [0:12:14] Question 3: Can you please go over and discuss doing an Exclusion" campaign through Facebook Ads? Hi, Fred! Can you please go over and discuss doing an Exclusion” campaign through Facebook Ads? Thanks so much. 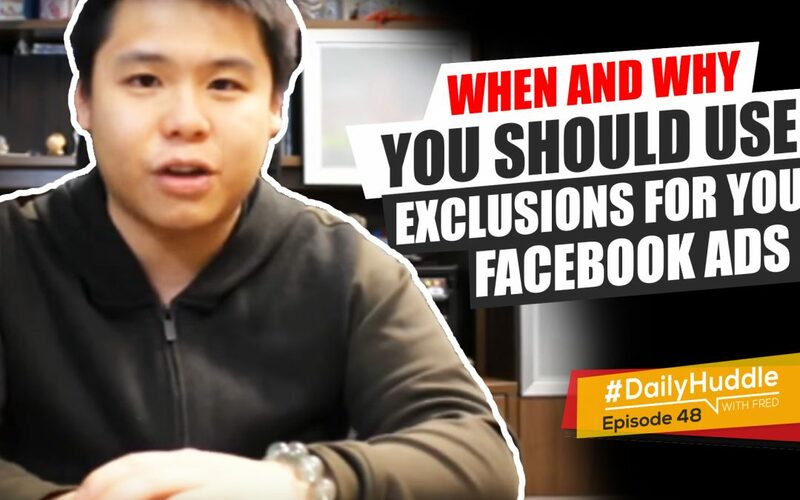 Again, this is the question that actually inspired me to talk about the topic today is when and why you should use exclusions for your Facebook ads. For me, right now, when I go after interest targeting, the only exclusions that I would have in my campaign is anyone that have either bought from me or anyone that have taken an action based on my marketing objective. Example, if you’re saying you’re going after – I’m going to use the example of Anna. Let’s say that I’m selling an iPhone case and I’m going after the market, the only exclusion that I have because it is an interest targeting, I would only exclude the people that bought the iPhone X case from me. By doing so, you’re not going to waste any advertising dollars to the person or the people that have already bought from me and keep bothering them with the ad. There’s no point. So, when it comes to interest targeting, I would always exclude the purchase. Now, you can go to an extent where you keep excluding other interest that you have running in ads too but it’s going to be way too much. Because your goal is very simple – your goal is to use interest targeting to move yourself into look-alikes. Look-alikes is where your business will start to blossom into success. It’s all in the look-alikes. Again, at the end of the day, I don’t really do a lot of exclusions in the interest targeting, but when it comes to look-alike, I do a lot of exclusions. Here’s what I do, when it comes to look-alike audiences, a lot of people would just go after the 1% look-alike. Again, it depends on where that 1% seat source is going to be. Let me actually share with you 2 routes right here. Route #1 is that let’s say that you want to create a look-alike audience based on anyone that have bought a certain product from you. In this case, let’s say it’s an iPhone X case. So, if I create a 1% look-alike of anyone that actually bought the iPhone X case, now I have an audience size. What that started to convert, what I would normally do is I would create a 2% look alike. Now, the 2% look-alike sometimes includes the audiences in the 1% look-alike. So, if I’m going after Facebook ads having 1% look-alike in one asset, 2% look-alike in the other assets and they’re both active, I would actually create an exclusion in the 2% to exclude anyone in my 1% look-alike pool and the reason why I’m doing that is because I don’t want to cause what we call the audience overlap. When you create an audience overlap, you are making it more challenging for the Facebook to optimize for your ads. In fact at times, you may compete against yourself because the 2% look-alike may have 20% of the people in the 1% look-alike and both are running at the same time, then that 20% will cross-over and you’re competing against yourself. You’re making Facebook algorithm harder to figure out what is working for you, what is not. You don’t want that to happen. So, that’s what you wanted to do. Again, it goes up, right? If you have 1% look-alike running, 2% look-alike running and 3% look-alike running, then your 3% should exclude the 2% and 1% and obviously at the same time is you’re always your customers at the same time too because you don’t want to continue to serve ads to the ones that never really bought from you. There’s no point to waste more money. Now, the other scenario with exclusions is as follow, in a typical eCommerce sales funnel, I’m not talking about other businesses, but it actually applies to the same thing. 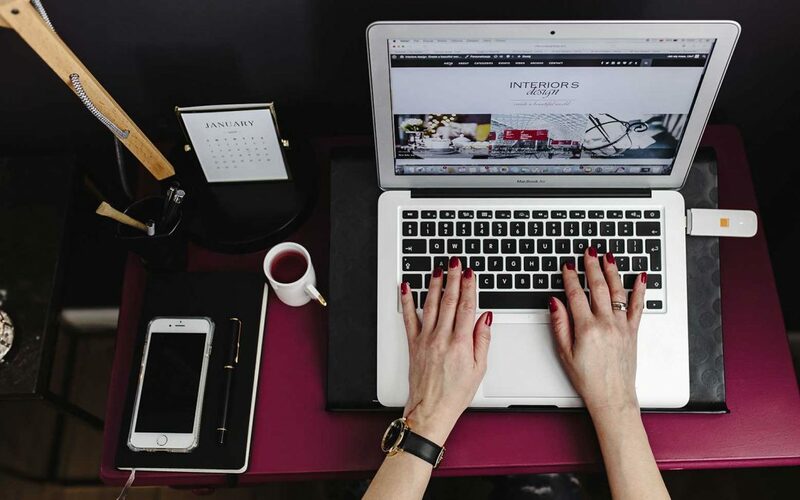 Let’s say a typical eCommerce sales funnel, you have your ad, it goes to the product page or a landing page, and on that page, you simply have somewhere add to cart. So, what happens is that on Facebook, it will trigger the view content pixel. So, they view that product. The second step is add to cart. The person click on add to cart on the product page. They go to the add to cart page where they look at the add to cart and that triggered another event through Facebook ads or basically Facebook pixel. The third is initiating check-out. 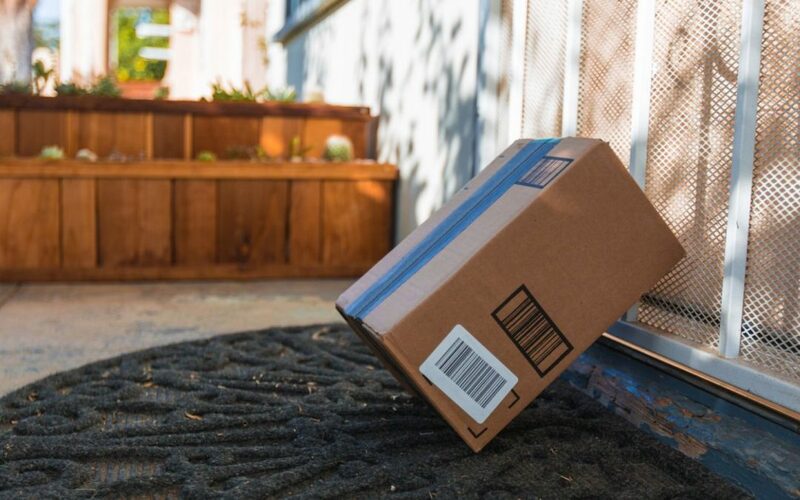 So, once they add to cart, they clicked on checkout to begin the credit card process of their shipping information etcetera. Then at the end, in between they’re still a make payment thing but I’m going to exclude that for now. At the end, there’s also going to be the purchase. In that scenario, in that journey of your customers, there’s viewing content, the add to cart, the initially checkout and they had to purchase. So, there’s 4 events that happened. Now, what you wanted to do and it is a wise way to do it, you want to sometimes – let’s say that I wanted to create a 1% look-alike for anyone that add my product to cart. I want to create a 1% look-alike for anyone that actually initially checkout. If you have these two active ads running, 1% look-alike on the add to cart and 1% on the checkout, then what’s going to happen is that you will have an audience overlap again because in order for the person to go to initiate checkout, they have to be at the add to cart. They have to click add to cart first before they go over here. What’s going to happen is that you will see a bigger audience overlap between add to cart and initiate checkout. It depends on where you are in creating a look-alikes, you then want to create an exclusions. So, once you have an ad to cart 1% running and you created another 1% look-alike for your initiate checkout, you would want to exclude what is the previous that is active. So in this case, your initiate checkout 1% look-alike should exclude the 1% of your ad to carts. I hope that makes sense. I know I went a little bit more advanced but again, when we talk about exclusions, it is more towards advanced topics. Let me know right below if I lost any of you. Put in the “me” if you guys follow and understand and when and where to use the exclusions. Inside Facebook ads, when you’re selecting the custom audience, there’s always an exclusion. That exclusion, you can exclude that specific audience. Also, at the same time you can exclude interest if you want. But I don’t normally go after that. When it comes to interest, I usually exclude my audiences, especially my look-alikes and all those other stuff and that’s what I would do. Moving on, seems like everyone understand it. [0:19:40] Question 4: Can I advertise 1 ad account in 2 different niches or many? Or 1 ad account one product advertising? For the first week, I want to create advertising 2 different niches at the same time direct to my General Store. How can I do this? Hello Fred! This is Guech. 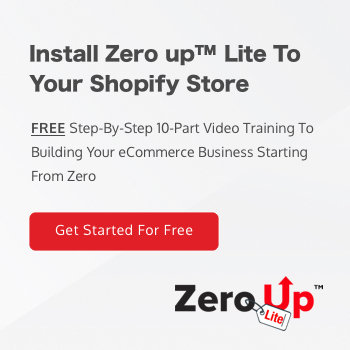 It’s great to be your Zero Up member! Thank you very much for your support. I’ve bought many courses, joined others and spent too much. Sometimes there’s no system or bad explanation, which isn’t easy to understand as a beginner. I’ve liked your Facebook page, but never visited until one day I searched on YouTube for “FB ads training” and up pop your training videos. Then I started following. I like your explanation! It’s so clear! Thanks so much! I started a general store and want to test many niches. Maybe first, where you said about having a Facebook business manager, with 2 or 3 ad accounts. My question is : Can I advertise 1 ad account in 2 different niches or many? Or 1 ad account one product advertising? For the first week, I want to create advertising 2 different niches at the same time direct to my General Store. How can I do this? Please give me some suggestions! I’m confused! Thank you very much! Remember one thing and every single one of you, even if you’re having a general store, one Facebook ad account, one website because you would want to assign that one pixel into that one website. Make that very clear. You need to really understand. 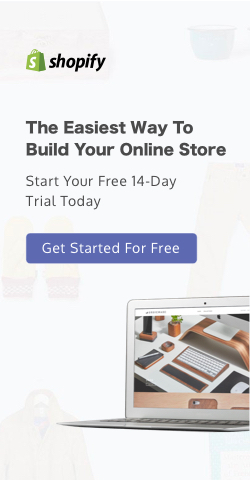 Now, if you’re doing a general store, which I am not really a big fan of, but I understand some of you guys want to use a general store to try multiple niches to see what niche works, what is working for you before you actually build your actual niche store which is going to be more profitable; I understand that. If you want to go to that route, here’s what you wanted to do – one Facebook ad account for your general store. Now, inside Zero Up, and for those of you that don’t have Zero Up, get Pixabay. Because what’s going to happen is that inside Pixabay, you are given the opportunity and the ability to create product conversion event. So, in your general store, let’s say for example, you have two different niches. One is in the kitchen, one is in tech and gadget. Now, what you can do is inside Pixabay, you can create a specific product conversion based on the kitchen product that you wanted to sell and you can create one or whatever product you want that is in the tech. When you’re advertising on Facebook, you tell Facebook to only optimize your ad, not the entire purchase of your stores but basically just the kitchen product that you’re advertising and for that specific campaign and for your second campaign, you can go and tell Facebook to specifically optimize your ads based on the tech. By doing this, you’re not going to confuse the Facebook pixel and it is basically best option for you at that stage. I really hope that helps you out. For those of you that don’t get why, it’s really because let’s say that you only have a purchased event and you don’t have a product-specific purchase event for each product you advertise and you’re telling Facebook that what’s going to happen is that you are going to get a mixture of audiences that are in tech, mixture of audiences in the kitchen. When Facebook optimizes for you, to take these two information, all the audiences that actually get a purchase regardless if it is a tech or if it’s a kitchen and compile it together and optimize based on that, then you’re not going to get the desired results because you are confusing the Facebook pixel on what you’re exact objective is or what your ultimate goal is when you are advertising. I really hope that helps you out. [0:24:41] Question 5: I created a brand new ad account and ad campaign. But before it could get out of the gate, I got a message that said payment and account disabled. I tried to create a new ad account but FB doesn't know me. What should I do? And does it mean that I can never use FB ads for any ventures for the rest of my entire life? I created a brand new ad account and ad campaign. But before it could get out of the gate, I got a message that said payment and account disabled. I tried to create a new ad account but FB doesn’t know me. What should I do? And does it mean that I can never use FB ads for any ventures for the rest of my entire life? Here’s one of the most important thing. One thing first is that Facebook needs to make sure that the name that you have in the profile matches with the credit card that you are about to use and to charge – very important. If you got an account disabled because of payment, that really means that Facebook want you to verify your identity and to verify that you are a real person with a real credit card and not a stolen credit card that you are using. So, what you wanted to do is to contact Facebook and appeal it and I’m pretty sure inside your ad account right now, there is an appeal function where you can appeal it and submit all the information that you need and once you have done so, probably it depends on the time, maybe a couple of days or maybe it’s going to be week or two weeks and then Facebook will basically go through the verification. They see that you are a real person, you’re going to be able to charge credit card, then you will get back your Facebook ad account. That’s my input and that’s my take for you in going from there. Other than that, I don’t really have much for today for our daily huddle and I know it is Friday. So, make sure you guys get some rest but at the same time, you still want to keep hustling, keep wanting to basically work on your business, spend some time because weekend for me is the best time for me to working and it’s my most productive time and maybe yours too. So, definitely take a look at that. Other than that, listen guys, if you want your question to be featured in our daily huddle, make sure you go to www.fredlam.com/ask fill in that form and I will get your question featured. If you guys love my content, love my videos, make sure you hit the like button, share this with your friend, tag your friends so that they can get the same knowledge as you guys. If you guys don’t like anything that I said, let me know right into the comment box. Other than that, I look forward in seeing you guys on Monday in our next daily huddle. That’s it for today. I’ll see you guys!